Alain and his son Elie make their Cerdon from Gamay and Poulsard, and follow the technique called "ancestral method" (in wider use is Méthode Champenoise, or else plain carbonation, the preferred method used for supermarket wines). 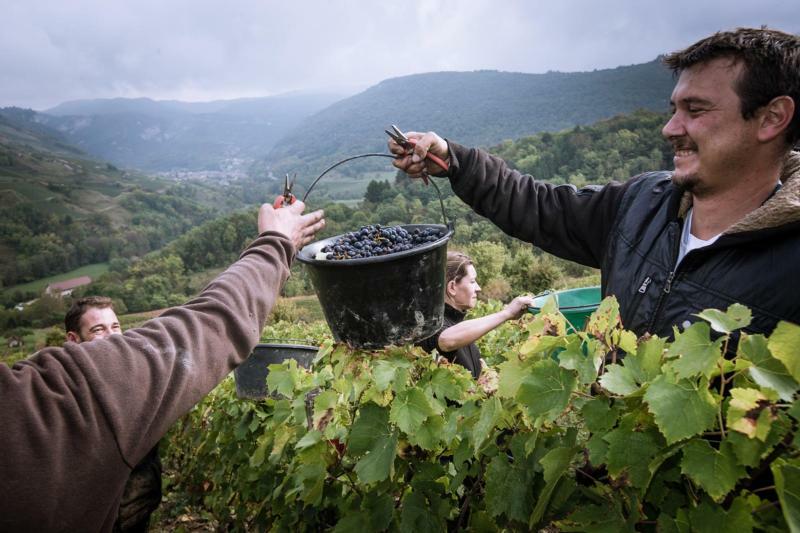 The grapes are picked by hand, pressed, and fermented in cold vats until the alcohol reaches about 6 degrees. After a light filtration that leaves most of the active yeast in the unfinished wine, it is bottled and continues its fermentation in the bottle, reaching about 7.5 or 8 degrees of alcohol and retaining a fair quantity of its original sugar. It is more vinous (with grapey primary aromas) than most Champagne, since there is neither dosage nor addition of yeast before the second fermentation. Cerdon is to be consumed throughout the year following the vintage. It is fragile and requires excellent cellaring and transporting conditions. Renardat's is delicate, berry-scented, refreshing, and makes a delicious aperitif or dessert wine (even chocolate goes well with it).